Guide Erich Hochhauser’s face looks so wind-worn you could crack walnuts on his cheekbones. Backpackers are huddling in tiny shelters beside the border checkpoint, a 90 km/h gale having brought temperatures down to zero or below. The roads – bitumen until this point – have turned to volcanic ash. The preferred people-moving vans of Chile have all morphed into Land Cruisers, the only vehicles brutish enough for travel on the high volcanic plain, or altiplano, where we’ll reach altitudes of 5000 metres above sea level. My driver, Rene, has negotiated this road his whole life, which is just as well, because today he won’t see it. When the dust storm clears for a few seconds, I watch Land Cruisers come at us at 80 km/h, missing us by centimetres. I brace each time they pass, but Rene keeps calmly chewing on his llama jerky. Outside, the world’s turned surreal. Appropriately, the high desert we’re careering across is named after Salvador Dalí. Pink flamingos stand in chartreuse-green lagoons, and lava rocks the size of my apartment double as boundary markers to guide us through. We’re barely an hour’s drive from one of Chile’s most popular tourist destinations – the Atacama Desert – but here I might be Mad Max in his V8 Interceptor; all alone save for a few hardy souls in 4WDs, their possessions packed tight on roof racks, traversing a landscape that looks just as post-apocalyptic as the movie’s. Suddenly, the wind stops entirely. And I see now we’re driving on the world’s largest salt flat – 12 000 square kilometres of crunchy white crust that shimmers under blue sky, surrounded by stark brown mountains and volcanoes. There’s not another vehicle in sight for the hour-long crossing – that is, until I see a silver Airstream camper parked in the middle of the flat. 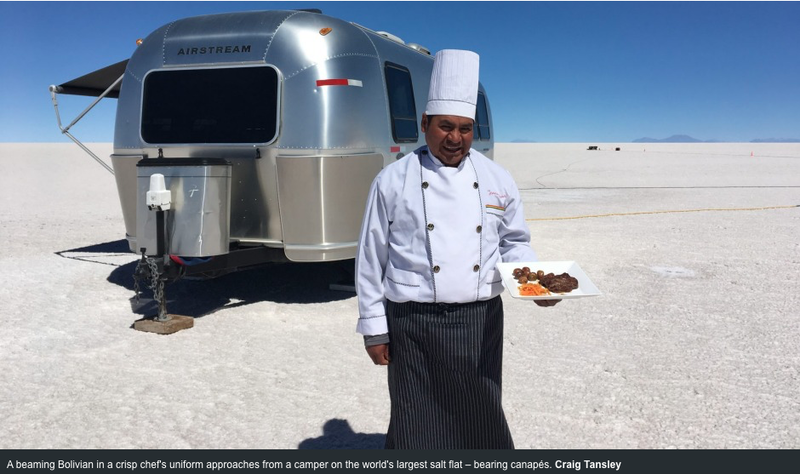 A beaming Bolivian in a crisp white chef’s uniform approaches, holding out a tray of what look like canapés. 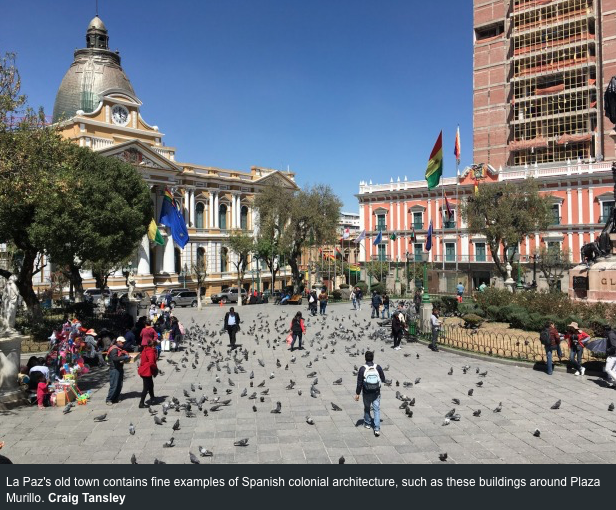 While the country’s better-known, better-resourced neighbours Peru and Chile attract millions of international travellers each year, Bolivia remains relatively undiscovered. Right now there’s no traveller within 50 kilometres. As the sun dips and the temperature drops 20 degrees in 20 minutes, I keep warm beside a wood fire, eating a three-course meal served under a billion bulging, blinking stars, with the Milky Way visible across the entire circumference of the night sky. Waking at dawn, the first sun rays light up Tunupa, the volcano that towers above my camper. Sleep was hard to come by last night – the stars were so bright outside my accommodation that I felt compelled to leave the warmth of my sheepskin blankets to step outside in the frigid air and behold the sky. Visiting the tiny farming community nestled beneath Tunupa, I watch locals plough the chocolate-coloured soil of pasture land that is separated by cobbled boundaries over 5000 years old, etched into the hillside. I’m driven to a large cave just beside the village; a farmer follows on a moped and kick-starts an old generator into life to light up an enormous chamber of intricate stalactites and stalagmites. I stare up at the walls as he waits, arms folded. 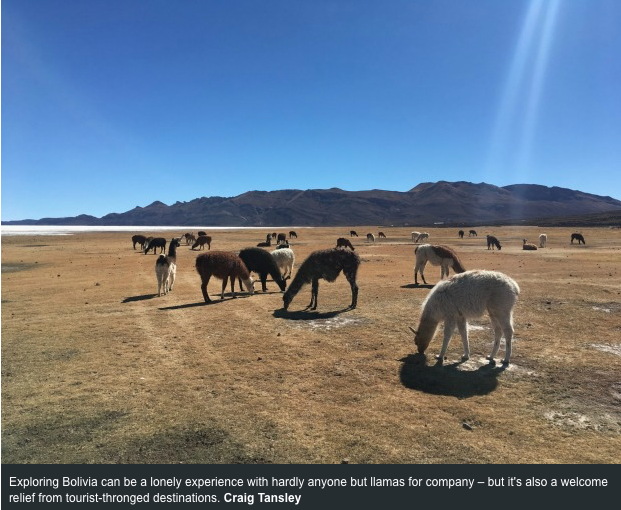 Tourism is like this in Bolivia; there’s an innocence to it, as though you’ve journeyed back in time to an era that precedes the commercialisation of travel. The crowds will come, eventually – tourism is becoming one of the country’s most significant industries – but for now, you can enjoy it without the travellers who flock to anywhere worth posting on Instagram. Even the capital, La Paz, is all but empty of international visitors. 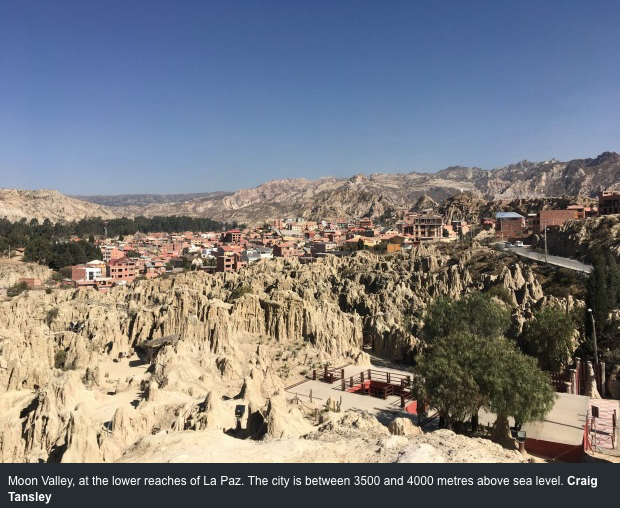 And yet La Paz is Rio with a nosebleed, a metropolis built at impossible angles about 3600 metres above sea level – the world’s highest capital city. While there’s a modernity to some of the city, llama foetuses hang by their necks (offerings to Pachamama, Mother Earth) at stores throughout the city, where shamans rule the streets. I walk along narrow, cobbled lanes, some still powered at night by oil lanterns. Through gaps in the streetscape there are glimpses of soaring, snow-capped mountains and homes teetering on sheer cliffs. At dusk, this must be the most extraordinary city on Earth: from the bar of my hotel, Casa Grande, in the lower part of La Paz, I gaze up at entire escarpments of rugged orange-brown rock that look like a suburban Grand Canyon, the twinkling lights of homes clinging to clay slopes coming at me from every direction. Each day La Paz’s inhabitants climb up to their impossibly angled homes, their calves sculpted as though from bronze. One morning I can’t help but stare as a blind man negotiates his way down a street with the pitch of a ski slope, and wonder what keeps him from cart-wheeling all the way to Moon Valley, 500 metres below. In La Paz, car wheels are chocked – no handbrake should bear this much responsibility. Even in Bolivia’s most popular tourist region, Lake Titicaca, it’s easy to find peace and quiet. On the Peruvian side, the world’s highest navigable lake bustles with tourists at Puno. But on the eastern stretches I step outside my lakeside hotel and watch the sun set across the water with cows and llamas for company. Here, the Andes are clearly visible, some peaks rising almost 7000 metres high. I pass donkeys laden with firewood and calico-coloured fields of potato, maize and quinoa farmed by locals in traditional dress. 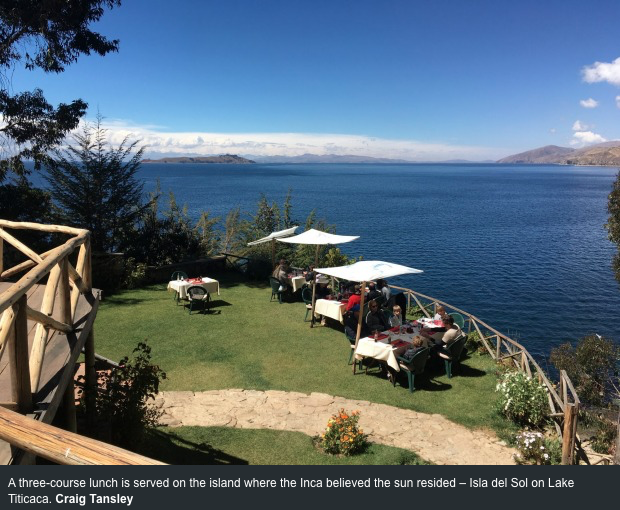 An old hydrofoil takes me to the lake’s Isla del Sol, the Island Of The Sun, from which Incas believed the sun rose and into which it set. Agricultural terraces, thousands of years old, are cut into the sheer slopes of the island, still farmed by about 800 resident families. I walk along terraces, passing shepherds herding their flocks, to a family-run restaurant, where I sit in soft sunshine on a pre-Inca terrace above the water. Crossing the border into Peru I stay at Puno’s finest, Hotel Libretador. And it’s here, in a space teeming with American and European tourists on luxury package tours, where bulletin boards highlight breakfast meeting times and harried travellers swish past in pants that zip off at the knee, that I long for the lonely Bolivian high plains, a world away from modern tourism. Getting there: LATAM operates seven one-stop flights each week from Sydney to Santiago in Chile, with onward connections throughout South America. From October 6, LATAM will also offer three non-stop flights a week from Melbourne to Santiago. www.latam.com, 1800 126 038. 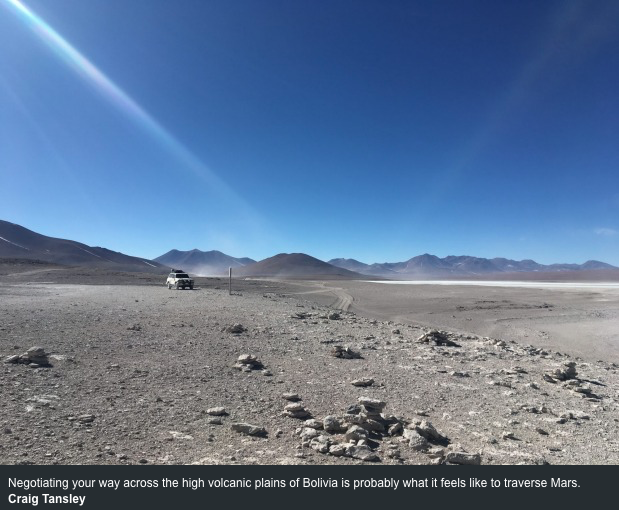 Bolivian Thoughts opinion: We have SO much to offer to our visitors! This entry was posted in Bolivia, Environment, Holidays, La Paz, Potosi, Tourism and tagged Bolivian cuisine, Bolivian heritage, high altitude, Salar de Uyuni. Bookmark the permalink.